I originally had an archive page for this Block, which I have amalgamated to this page now, so you might see some duplication in the descriptions. I will try and clean that up down the road. 1939 view of 1200 block, North side of 4th St. looking east from 13th Ave. I spent quite a bit of time researching the places in this photo, for another project, so figured I wouldn't waste the research and add it here, in case others need it one day. As you can see, lots of unknowns. and I am sure lots of names I haven't seen yet. That other project, described above, was a secret but now that it is done, I can discuss it here. Started in March, and was completed Nov 14, 2010, Artist Linda Gudmundson, and her husband, have completed a Mural, based on the 1939 postcard above, with some research from below. The Mural is on the side of a building in Estevan, at 1123 4th st.vIt was commissioned by Seiver, Veermersch & Fonstad, Professional Accountants in Estevan. Now it is in full color, looks life like now! great job Linda! Buildings from Left to Right, on 1939 photo above, all on the North Side of 4th St. between 13th Ave on Left, to 12th Ave., 3/4 of the way down the picture, are described on this page. All pictures noted below, are in Vol. 1, “A Tale That is Told” Estevan History Book. Most of the info researched from there, as well as the Central School History book, Census, Cemetery Records, Estevan Mercury, FreeBMD, and other sources. Bank of Montreal (2017) On this corner for years was an empty lot, but as it turns out from some digging by Barry Dies turns out the First Clasky Store was located here, (Clasky bought out a store on 4th st after this) as well as a McLeod Insurance agency and another unknown name business. It was a large building with 3 peaked roof sections, visible from down the street, and the building and businesses actually all faced 12th ave, and would have had 12th ave addresses. It disappears after a while, and then the B of M appears. Most folks remember the empty lot only. see my 12th ave section for more. Originally Dr. Ernest Harold Scott's Drug Store, Post Office, and Town Library were located here, in a 2 story building that stood on this corner. It burnt down Feb 23, 1909, same time as the Kelly House across the lane, to the north, behind it. 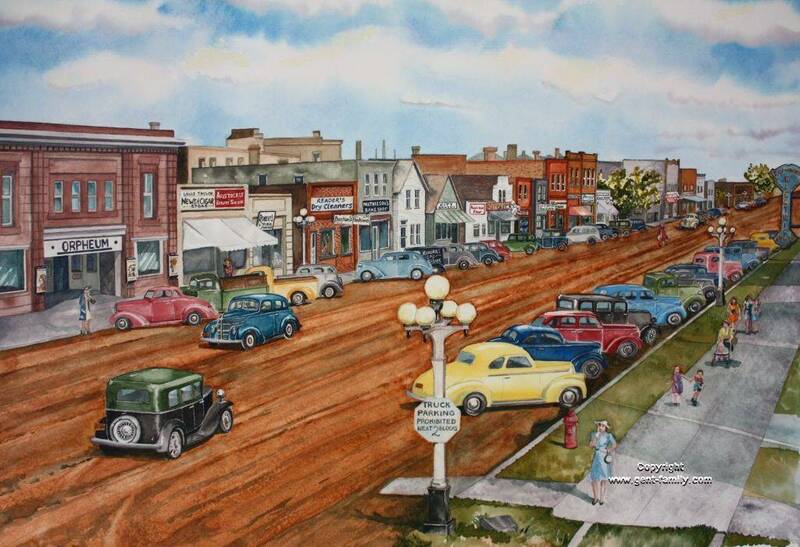 but in the 1939 picture, too early for it, The Bank of Montreal, was built in 1948 there. This was an empty corner lot for years, nicknamed “Bums Roost” But as Barry Dies found out the Campbell Block was built in this lot, facing 12th Ave. Became Stockwell & Perry after J. R. Stockwell died. ; Part of Perry Hardware later on. ; Barber & Pool Room here in 1921, Bernard Schaffer Prop. lived on 2nd st. ; McBride's The Quality Grocer located here, in 1955, E. H. Chapman Owner and manager. Right beside Bank of Montreal, “J. R. Stockwells Hardware” (1892), First Hardware Store in Estevan, 25 ft x 40 ft Stone construction. They had a framed living quarters in the rear. Mrs. Stockwell operated it until the Spring of 1903.
who James married in 1895, was born Mar 8,1873, in ON. 1903 Ally entered into partnership with her brother Truman. She remarried to Mr. Marshall Henry King in 1907.
at 1207 4th St. ,which was a vacated implement building. A tin shop was moved from this stone building to next door, (1955 map, Lot 17 above), to the upstairs there. 1919, The Tin Shop was moved back to the rear of this building. 1916, Thomas “Albert” Perry, their brother, became a partner. Name was changed to “Perry Hardware Company”. 1935, became “Perry Hardware Limited”. 1947 Albert Perry became sole owner. 1958, sold hardware section to son, Donald (Don) A. Perry. in the Estevan Mercury ECI Reunion 2000 Paper. became Perry Hardware (57) Limited. Son Allen Perry, had Perry Plumbing and Heating Limited. Allan Perry is also deceased, d- 2004. Perry Hardware had the first telephone installed in the district. The family came west in Mar 1892.
went on to become a very highly regarded Geologist in Canada, and received many awards and acclaim for his research. Also known as an Explorer for his travels in 1932 to Great Slave Lake. See Picture, page 484 and 485, for detail of it. when he returned to Estevan, he was shown as age 45, as that was the highest age one could serve. He was older of course. only the 3 males were there in 1911.
b- 1916, d- Dec 20, 1962. George was a great athlete at ECI. Howard Patten printed a weekly paper in Estevan starting in 1933 to 1936, named “The News” in this building. Howard came from Macoun SK, where he published the Macoun Post. File updated by Larry Preddy, Mar 2010, “McBride's Grocers was at 1205 4th street, not on the west side of Perry's, but on the east side between Perry's, and the Bank of Montreal. Elmer Chapman operated it until White Cross Drugs purchased it in 1973/74. I know this because I worked there. at one time as there was just a beaver board wall between the 2. I don't know when the wall was constructed to separate the building from Perry's. Lot 24-Lot 25- Block 19, #1207 4th st.
see next lot for complete info on Perry hardware. Mr and Mrs. Albert Edward McCormack owners. Built ca 1915- sold ca 1946 To Ned & Irene Rooney. My Aunt Emilie Backman worked in this store. C. S. Meyer had a Meat market here in 1921, Charles S. Meyer owner. Middle 2 story brick, awning, West side of the building, in 1939 photo above. West (left) and East (right) side of the Perry Brother's building. then obviously moved to 1205 4th St., see Larry Preddy's update on Lot 50 below. I imagine the move was when Elmer Chapman purchased the business. Dr. J. E. Wright was a Dentist in an office above Perry Hardware, not sure if East or West side? He became the First Commanding Officer of the South Saskatchewan Regiment., Rank Lt. Col.
operated by one of Estevan founders, John Mcleod. Later his son Norman L. McLeod. Mr. Parington ran this shop for a number of years, until he retired and Major Wellock took it over. Major Wellock supposedly went into partnership in 1915. So now we know where Wellock's Meat Market was first, also. 1925 Wellock's moved across the street at 1225 4th st. They were still there in 1955. Major Preston Wellock came from England in 1907. He resided at the Mcleod farm, and worked at the Meat Market. d- Feb 2, 1954, buried in Estevan City Cemetery. Note- His birth name was Major, this is not a rank. At one point in time this building was sold and operated by Robert Coxen, until he also moved out of town. Became Walkaway Shoes, after the Wellock Butcher Shop. Still not 100% sure if this was not in the Lot 14 above. 2 Dames Paint Store, (2009) I know a Peter Cummins operated a butcher shop in the 1920's where House of Stationary was, need to pin that address down. it could be this, or one on each side? Mrs. Eleanor Liddell (Lennie) Archer nee Wallace, lived here in 1921, Violin/Music Teacher. b-April 28 1876, in Ravensworth Estate, Lamesley, Gateshead, Co. Durham, England. she had 2 children with her in 1921, Helen Mary Archer, b-age 13, in MB and Harry Archer, b- age 10 in AB. Her husband was Norman Gillies Archer, b- 1880, d- 1955, but he was not with the family in 1921. 1955 map- Lot 46- Turner Electric (1955 history book), Started in 1947 on 4th st. Owned and operated by one of Estevan's Founding Fathers. John Mcleod, Their meat market was downstairs, and they had rooms above. Their son Lawrence McLeod was actually born in one of those rooms. On the left was actually a 2 stall, open barn, or garage, which was attached to the meat market. The garage and this building are quite noticeable, in all the first Estevan pictures. I show him in Lot 49 (1955 map above) building as well, maybe later he was there. Mr. Boakes in the white coat. At this time the store had a solid wooden awning on right, and there is a retractable one above the door and window. ca 1910/11, Mr. Boakes on left, here a remodelled front is visible, looks like a new window on left, and probably right, and a nice new sign. in 1906 the McLeod's rented their Meat Business to Joseph Davies (Joe) Partington at this location. Mr. Partington then moved to their new building (1955 map, lot 49) and was the butcher there as well. d- Nov 15, 1955, age 81, in Vancouver B.C. J.D. Partington was a member of the Masons. He immigrated to Canada in 1887. Served as Estevan Councillor, elected in 1912.
had 2 sons, 1 daughter, all children born in SK. as shown in 1911 census. Their mother Elizabeth, nee Bell, immigrated in 1904. Ruby also attended ECI, graduating 1921, age 16. Ruby taught school in Bienfait in 1925. This family also appears in the Shand history book. Ruby and her brother, Davis Partington, were teachers there. Ruby was also a teacher in North Portal. and last one teaching at Minto School. I also found her teaching at Lambton School #767, 5 miles south, 1 mile east of Bengough. And at a Tyvan School #1269, ca 1930-33, North of Weyburn. One article says she earned $6 per month teaching school at age 16! She married a James (Jim) Forrester in Vancouver. Ruby lived to be 103, died late June, 2 weeks before her birthday. Ruby enlisted in 1938, and served in WWII, Army, Radar Specialist, on Vancouver Island. Ruby and Jim moved to Bellevue WA, USA. She continued to teach, he worked for Boeing. Member of Bellevue Sister City Association, She even went to Taiwan, and taught English, for a year there. She volunteered on the ski patrol at Snoqualmie up until age 86, when she had knee surgery. Ruby was heavily involved in the Audubon Society, and an active Rock Hound. She credited her grade 1 teacher in Estevan for the interest in birds. Imagine how many children she taught? and he is buried in Estevan City Cemetery. The McLeod's supplied the meat wholesale to Partington's store. So maybe Mr. Boake's ran the grocery store, and Mr. Partington ran the Butcher shop? I just don't know. until 1916, when he went working for the railroad. In 1911 he was boarding with the Rooks family. Next door was the Partington family above. His wife was Alameda McDonald. The 2 story building with the cross shape roof is the right side of this business. History book says Symons bought adjoining business of “J. Mitchell Grocery Store”. In 1957 this was all sold to “Woolworths”. later became the “Saan” Store. then “Liquidation World” early 2000. Same location as Saan Store in 1980. Exact lot or building I don't know, but per 1921 entry it was here. “Mathison Bakery” located here in 1921, Fred Mathison Baker, and son Frank William Mathison, lived at #422 13th Ave., William D. Coster, Baker as well here. Big Tree, and what I think is like a walking lane, in the middle of the block. in 1939 photo. “D.L. Irvine Drug Store” located here in 1921. David L. Irvine lived on 2nd st.
2 story plain- no sign visible, a small window above the door, 2 windows top floor in 1939 photo. called Hobbs Boarding House, built in (1892? or 1893?) owners, Billy and Miss Hobbs, his sister. Somewhere along the line I think the business was called Mathieson’s (Matheson's?) boarding house, also Mathieson's White House. Can't find much info on the Mathiesons here (caption on picture page 481) see lot above has Mathison's bakery. 2 spellings same name? Building tore down in 1958, Toronto Dominion Bank, built new building on this lot, it opened Apr 14, 1958.
they moved later to corner of the next block west. 1301 4th St.
Update from Larry Preddy- Ron Fichtemann had a florist shop where Melle Jewelers is now for a while, before Melle's. 1947 picture below looks to me like top sign says “a name” then “Electric” so possibly an electrical shop in there then? Housed the Tisdale Dry Cleaning plant, (until 1961) moved from the Turner building, which was originally in Tisdale's store below. “Donaldson's Mens Wear”, in 1955, Joseph “Joe” Donaldson, Owner and Manager, who lived at 1227 4th St.
All I can find is they were a Jewish family in Estevan. The Cleaners were in the back of the Clothing Store. Talked to Wilfrid's brother Donald N. Bastian Aug 2010, and he told me some of the history of this store. Orpheum Theatre, built in 1913-1914, by H. E. McKenzie who was co-owner with F. W. Newcombe. It opened Apr 6, 1914.
ca 1900- First couple lots on this block were originally Marshall H. King's Lumber Yard, which ran all the way north to 5th St.
Their history is shown below re the Perry Hardware Building. Lot 40- #1239- Alice Livingston Millinery Shop here in 1921.